The Severo Ochoa Centres and Maria de Maeztu Units Alliance (SOMMa) gathers research centres and units that received the Spanish Severo Ochoa and María de Maeztu excellence awards respectively. Thanks to the support of the Spanish State Secretariat for Research, Development and Innovation, these centres and units have joined efforts to promote, strengthen and maximise at the national and international level both the value of science of excellence produced by research centres and units, as well as its economic and social impact. 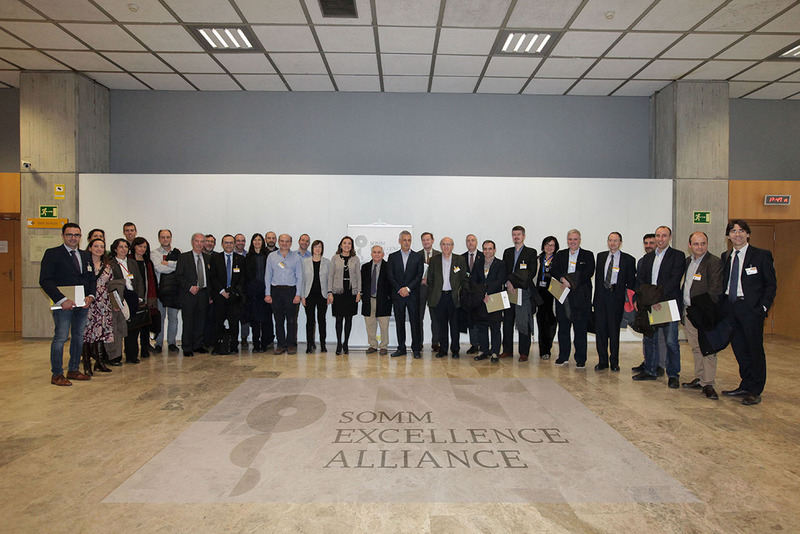 In an event held in Madrid on Monday, March 12th, representatives of SOMMa, together with the Spanish State Secretary for R+D+i, Carmen Vela, presented the new SOMMa alliance. “Spanish science comprises centres and research units of excellence that compete successfully at an international level. Uniting into this alliance allows us to join efforts, increase our impact and promote collaboration and networking. In summary, to enrich the R+D system of our country on the long run," expressed Teresa Garcia-Milà, vice-chair of SOMMa, and director of the Barcelona Graduate School of Economics (Barcelona GSE), during the presentation. Among the objectives of the Alliance stand out: to increase the national and international visibility of Spanish research, as well as its scientific, economic and social impact; to promote the exchange of scientific knowledge and good practice between the different actors of the Spanish R+D system; to establish a dialogue with society and contribute to the nurturing of scientific culture; and to have a voice in scientific policy both in Spain and in Europe. The full body of SOMMa centres and units gathers more than 7,000 staff dedicated to research, graduates every year more than 500 PhD candidates, and perceives funding for European projects representing an approximate turnover of 530 million Euro over a five-year period. In 2016 alone, research produced in SOMMa centres and units has been published in more than 5,800 papers in the best scientific journals, has given rise to 8 new spin-off companies, has yielded more than 100 patent applications and approximately 350 collaborations and contracts with companies. "These figures prove that the Severo Ochoa and María de Maeztu program has boosted the impact, international scientific leadership and competitiveness of these centres and units. The alliance will be very beneficial because it will allow the best centres to work together in a coordinated manner, which will contribute to expand their impact," declared the Spanish State Secretary for R+D+i, Carmen Vela. “We acknowledge the efforts of the Spanish State Secreatariat for R+D+i to create and preserve the Severo Ochoa and María de Maeztu program despite the economic crisis and the public budget adjustments. Even so, we must insist in the importance of the investment in science, which requires a long-run State agreement,” affirmed Luis Serrano, SOMMa hair and director of the Centre for Genomic Regulation (CRG). Apart from requesting a firm commitment to uphold funding levels, SOMMa also exposes the existence of certain administrative particularities severely compromising the R+D system, which require of political will to be solved. During the event, the document “SOMMa Position Paper: Actions required to safeguarding science competitiveness” was presented, which intends to draw the attention of politicians to tackle the aforementioned issues urgently and sustainably.In summary, the three administrative issues exposed in the report refer to the criteria for VAT deduction, the personnel hiring regulations, and the new public-tenderlaw. These three subjects are currently causing serious problems to a number of research centres, and can potentially affect all other research institutions of the Spanish R+D system. The consideration of research, and basic research in particular, as an economic activity, as well as to note that research is an activity of general interest, whose competitive funding should not be subject to VAT. The modification of the public-tender regulations for research centres and universities adapting it to their needs, within the framework of European regulations. The loosening of existing limits to the staff turnover rate, particularly for structural staff, as well as the inclusion of particular non-permanent, open-ended contract typologies. These contracts could eventually be covered with competitive funds from the State’s R+D+i Grants scheme, and should not be taken into account within the staff turnover rate. In general, the current situation affecting the research centres regarding the above mentioned administrative issues, is the result of putting research centres and universities on the same level than other public administrations, without taking into consideration the particularities and necessities of the scientific activity. "We need to have science also present in the political agenda and we hope that SOMMa will be able to work together with the Spanish Secretariat for R+D+i in that direction, for the benefit of not only the centres and units of the alliance, but of all the R+D system in Spain." Download the Press Release in English and in Spanish.